In July of 2016 my wife and I moved back to the great state of Oklahoma, the state of our births. After almost 50 years of living in California we were both thrilled to make the move. We live in a development that is about 15 years old and by necessity are members of the Homeowners Association. We pay monthly dues to keep the grass cut in the areas of the development open to all association members, maintain the swimming pool, pay a lifeguard, and to provide the other services needed to keep a large development looking good. 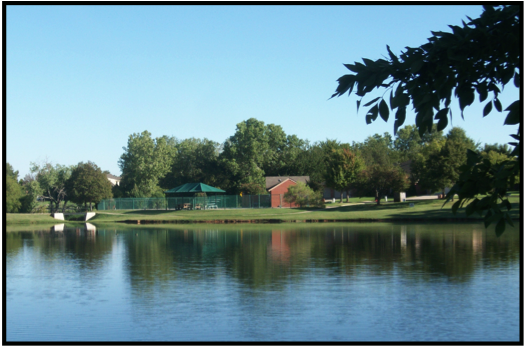 The dues also help pay for the upkeep of two ponds that association members have access to. Both ponds are rimmed with cement sidewalks. The swimming pool is in the northwest corner. The pond on the east side is almost as large as the west side pond but the banks leading to the water are steep and only serious anglers (or nature observers) visit the east pond. There are benches placed around the ponds that invite you to just sit and enjoy the beauty and peace a natural scene and environment can provide. Our youngest grandson is 4 years old. His name is Trent. 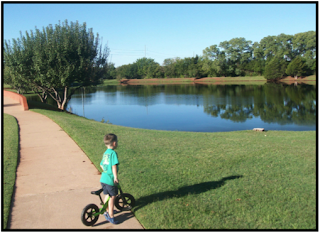 Soon after we moved in, Trent and I began to take a daily walk from our house to the pond. One morning we met a lady that was feeding the ducks and geese that live on the pond. She advised us as to what seed to purchase that was healthy for the ducks and geese to eat. That day we drove to the feed store and bought a large sack of feed and we are now in the habit of feeding the ducks and geese, almost everyday, soon after breakfast. As we sat on a bench and I watched Trent feed the ducks I decided to start making a survey of the plants and animals living in and on the pond. As Trent continued to feed the ducks I began to point out to him the variety of living things that made the pond their home. In the next post in this series I will describe the pond's bird life that Trent is able to recognize and name. If you live near a pond, lake, stream, or any other body of water that supports life, I encourage you to start your own survey to find out what is living on and in the body of water near you. You may be as amazed as I am as to the variety of living things, both big and small, that thrive on or in a body of water. Our robotic exploration of the surface of Mars is looking for signs of water because the presence of water means the possible presence of life.